fresh out the bar and looking to "chat it up" on what was supposed to be my relaxing weekend getaway. Not to mention how disgusting the beach is the day after Khmer New Year, literally lined with trash. There is a much better alternative if having seclusion, peace and quiet on a picture perfect beach are what you are after...Rabbit Island, or "Koh Tonsay" in Khmer, is where you need to be. 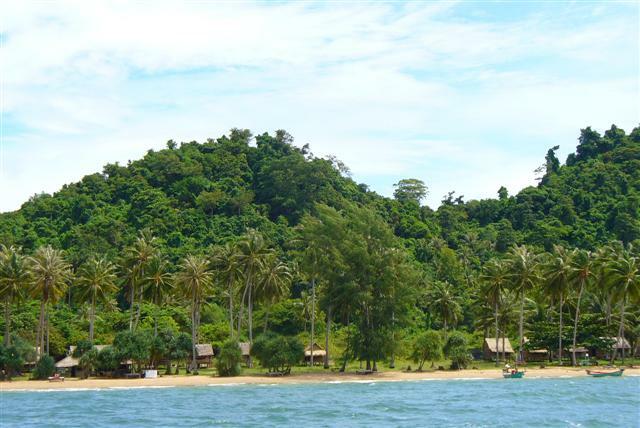 This tiny island is only 2 square kilometers in size, and just a 25 minute boat ride from the beach in Kep. There are about 7 or 8 local families who actually live on the Island, making their living from fishing and growing coconut trees. These families also make a little extra by renting out the thatched huts along the beach to any visitors that happen to stop by. At any given time, you are not likely to have more than 15 or 20 people to share the entire island with. There are two beaches on this island, one of which you must hike to access (but is well worth the hike, not only for the gorgeous beach but also for the hike itself). 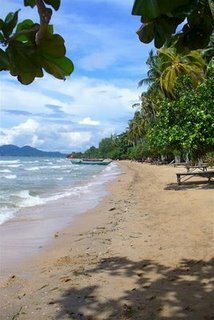 The main beach is just as pretty as any postcard, with coconut palms lining the white sand, with lush jungle covered hills in the background. There is no electricity except on a generator from 6-10 pm, no motorized vehicles, no karaoke bars, no litter along the beach, just picture perfect, peaceful isolation. The huts are fantastic if you like "roughing it" a little bit...when we got to ours, we found nothing inside but a mattress on a rustic bedframe and a mosquito net. The bathrooms are about a minute's walk behind the huts, and the "shower" is not much farther. The huts are up on stilts, and the whole thing is constructed of bamboo strips which filters in the light beautifully. 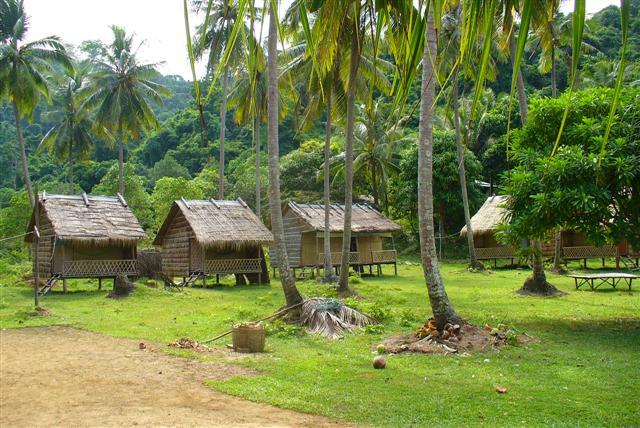 These huts all cost $5-10 per night for a double "room." The food is amazing, being fresh crab or prawns fried with famous Kampot pepper. The average cost is $5 per plate, which isn't cheap by Phnom Penh standards, so bring over an ice chest with your own food if you're on a budget. The swimming is ideal, since the water is warm but not too hot, gentle waves and the entire beach on a gradual slope which means you can walk out very far and still only have it at your knees. Careful though, I stepped on a Sea Urchin (the non-poisonous kind) and if it hadn't been on my last day, would have ruined the trip! I suggest wearing some water shoes. Also, I am told that there are tons and tons of beautifully colorful fish around the rocky areas, which makes for great snorkeling...I wish I knew it when I was there! I will be sure to bring some snorkeling gear next time! The hiking is an absolute must...we even lost the trail and got ourselves lost for a good hour or more, but we got to see some of the best scenery I'd ever encountered. You will encounter a mandrake grove growing in a "bog" (claylike mud that is almost impossible to walk through...I say "almost" because we walked through it. I don't recommend it.) There are local fisherman and kids hanging around this area fishing/farming seaweed and I highly recommend that you get one of them to paddle you to where the trail starts back up again. A little knowledge of Khmer here would help, but I'm sure holding up a few dollars and using hand motions while pointing to the boat will do the trick. Don't forget your camera, this hike is incredibly beautiful. You can also see some of the local people busy at their daily work, and their homes...great photo opp's. Not much else to do in the day except lounge in the hammocks and read, nap or just enjoy the view...this isn't the place to come if you're after some wild nightlife. At night, you can get a fire going right on the beach and do a traditional Khmer BBQ over the little coal stove, if you want. The sunsets I saw here were some of the best I've ever seen. To get to Rabbit Island, just take a bus to Kep (actually, you have to take a bus Kampot, and whichever closest village the bus stops at, then take a tuk tuk over to Kep. Easy enough to arrange.) I would love to interject some commentary here on all of the cool things to see in Kep, but I'll save that for another post). It was the ultimate getaway of the French Colonists in the 50's, and the decaying villas lend an intriguing and eerie presence to the town. Anyways...back to the point. Once you get to Kep, you can arrange with any of the guesthouses along the beach for a boat ride there and back for around $10-20 return trip (per boat, not per person.) Or, if you speak enough Khmer, go to the Pier and try to arrange directly with the boat operator. You can choose to go out just for the day and return to Kep for the evening, but it would be a shame to miss the beautiful sunset and the lovely dusk views of the island. Just don't forget your snorkeling gear! Hurry and visit before development hits and this becomes the next Sihanoukville. I agree that Ochheuteal beach is too crowded, etc., but if you're stuck on the mainland or don't like boats, there are much better beaches in Sihanoukville. I've lived here for nearly nine years and can't remember the last time I went to Ochheuteal. Unfortunately, most visitors think they have a choice between that or Otres. There are many others. The best info is non at all or its little gem is going to end up like sihanoukville for sure. I have been there twice & not planning on going back again. When those obnoxious tourist u talk about start to inhabit the rabbit, which u have now let the cat out the bag(cheers for that by the way).You will have stuffed it up for all of us. My Khmer wife is pissed at Your blog also because for Khmer family's there is not many places were they can go & do the same as u & without crowds of young European backpackers living on $2 a day stuffing it up for them & this it there own country. Put yourself in there shoes, Then would u promote this like you have? I recommend Koh Rong for a visit its better is every way,U will hate Rabbit island .Big mosquitos, & sandflys that piss on your skin till u bleed ,expencive crappy meals & drinks because there's nothing else but 2 shanty restaurants. & don't even get me started about the showers & toilet. Oh forgot to mention the raw sewage flowing directly into the best beaches for a swim. Nothing worse then a blocked snorkel from a big floating turd. Visit beautiful Koh Rong island u will thank me later for this free advise. Great post - just the info I was looking for. I would like to rent one of the huts from a local family. How do I arrange that? Also, i only have nine days in Cambodia. Anywhere else that can't be missed? Brilliant Amber. I live in Kompong Som and fully agree about the main tourist beaches. It's Independence Beach for me but they're about to develop that now, so not long before they've destroyed everything here. Now that's my kind of vacation. Thanks for all the info and I'll be sure to use it when I go to Rabbit Island.